One of the main causes of fire within the home is due to faulty electrical wiring. The NICEIC – the regulatory body for the UK’s electrical sector – strong advises that a full and complete inspection of your electrical system is a must to do at least every 10 years. In this post we will explore 3 signals that let you know when your electrical wiring may no longer be safe and requires a professional electrician to inspect and repair. Safe and fully functional electrical wiring should make absolutely no sound at all, so if you start to hear any buzzing sounds then there is most likely something affecting the current, such as a loose connections or frayed wires. This can often be traced back to a specific outlet; should you suspect that an outlet is making a buzzing sound then get in touch with a local bristol electrician to take a further look at it. If you start to smell any burning odours in your house – especially if they not pleasant odours – and you cannot identify their source, turn off your circuit breaker and consult professional electrical contractors immediately as this could be a sign of something very dangerous. They will need to check the electrical wiring, appliances, and wall sockets to see whether anything is overheating. The switchboard is made up of the main switch alongside circuit breaks and fuses which play an important role in protecting your electrical wiring. By overloading your circuit with too many appliances that exceed the amp, you can cause a circuit breaker to trip – cutting off the power supply – or cause a fuse to blow. 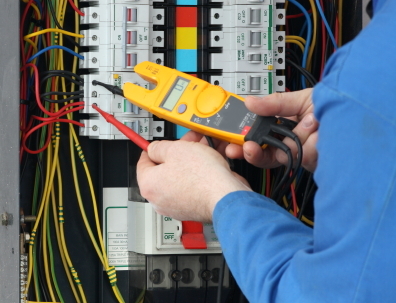 If you are looking for reliable electrical contractors to inspect and repair your electrical wiring, get in touch with the R D Nelmes Electrical today.